the characteristics of the growth medium. Tomato fertigation also depends on the growth medium. The coarser the texture of the medium the more frequent and less water should be applied at a time. Crops grown in high density medium should receive water less frequently but more at a time. Typical frequencies are listed in and should only be used as a guide. 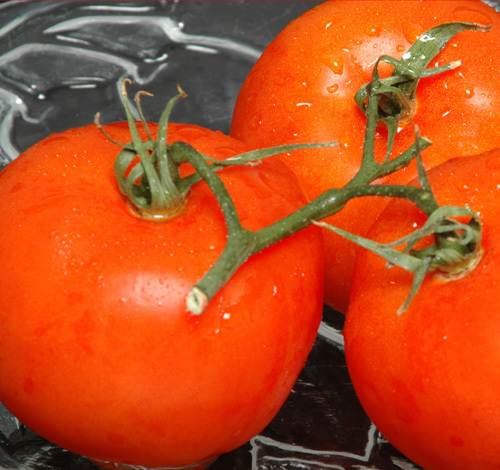 Tomatoes grown in GFT systems have less problems with water logging. It is important to maintain a very thin layer (not more than 2 mm) of water at the bottom of the channel. To high flow of water will result in water logged conditions and the development of algae at the surface of the gullies. The algae will also attract fungus gnats that feed on the plant roots. A general tomato fertigation formulation that can be used for tomatoes is listed in the table below. However, the fertilizer combinations presented should be adapted to the grower conditions and variety. Informed decisions should be based on water and plant analysis with the help of an expert. Many books provide fertilizer recipes, but they are not the alpha and omega of plant fertilization. There is very little doubt if one fertilizer program will be significant better than the other if the basic principles are followed regarding plant nutrition. The main problem found with tomato fertigation recipes are their implementation in the irrigation system. Factors such as how the fertilizers are mixed, at what pH are they mixed and the quality of the various components making up the fertilizers. Another very important factor is the quality of the water which can have a significant effect on the growth of the plant.